Hello and welcome to my Yokohama YK740 GTX review. You can really find a plethora of tires on the market today, at wildly different price points. 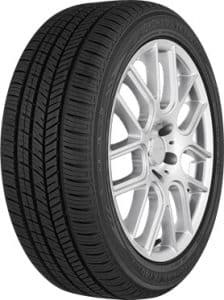 Cheap tires should be avoided because they seriously harm the safety of the vehicle, but there are some really good tires in the budget category. Then, there are premium tires, which offer the best performance but are sometimes out of reach for most buyers. Yokohama is a company that produces premium tires, but their models are priced slightly lower than offers from Michelin, Bridgestone, and Pirelli. This puts them in serious advantage for some buyers, especially those who drive a lot of miles or have a vehicle with very big rims, where the price advantage is even more pronounced. The YK740 GTX is an all-season touring tire from Yokohama that promises great traction in all weather conditions, excellent handling, long treads life, and smooth and quiet ride. Despite being a little cheaper than other premium competitors, Yokohama equips its tires with high-tech features. Some of them even push the whole industry forward. Let’s talk about them first, and then give an opinion on the tire itself. When reading about this tire on Yokohama’s website, it’s clear that their main goals were to make it durable, quiet, and to give it all-season traction. This is something that every touring tire tries to achieve, but most of the time not successfully. To achieve those things, Yokohama incorporated several tried and true technologies from their arsenal. First and foremost, the tire is made from ELS Orange Oil tread compound that should give it excellent traction in dry and wet conditions. The Orange Oil also keeps the rubber pliable at lower temperatures, thus giving better performance in the winter. The triple 3D sipes, on the other hand, provide more biting edges, which additionally helps in wet driving, and snow traction. The asymmetric groove arrangement provides much better handling characteristics and enhanced road contact, while the treads are deep for better resistance of hydroplaning. High-speed stability was another concern for the company – they incorporated nylon cover in the tire for enhanced stability. Durability is also covered by wider tread profile, that helps for a stable contact patch and even wears. Yokohama offers 60,000-mile tread warranty, which is not on the level of some other premium touring tires, but in my experience, tread warranty doesn’t always translate itself into longer lasting performance. The Yokohama YK740 GTX is available in a wide range of sizes from 15”-20” in diameter, and 175-255 in width. In other words, this is a tire that’s a good fit for smaller subcompact vehicles, larger sedans, and even crossovers and SUVs. I already mentioned that even though the warranty is a bit shorter than in some other premium touring tires, the YK740 GTX can still be durable and long-lasting. And that’s really the case here. This is a tire that will last you for a long, long time – even after thousands of miles the tread pattern will still be deep, and there will still be biting edges for better wet and snow traction. It is impressively strong as well and should keep its form even on heavier vehicles, probably thanks to the Orange Oil in the rubber. Of course, how much a tire will degrade depends on other factors, such as the type of your vehicle and the way you drive, but the YK740 GTX can still hold its own even on some more powerful sedans and SUVs. Impressive showing for the Japanese manufacturer in the durability and treadwear category, as always. Touring tires are known for comfort and durability, but never for excellent handling properties. So, is the Yokohama YK740 GTX any different? Okay, it’s not sporty by any means and doesn’t provide the most precise handling in the world, but you’ll be surprised at the amount of grip there is on offer. Even when entering the corner at higher speeds, the YK740 GTX holds itself really well and keeps on going, while high-speed stability is also above average. Definitely one of the best touring tires in this department. The YK740 GTX has really deep grooves and treads, which certainly helps when there’s a lot of water on the pavement. The tire resists hydroplaning really well and the driver has all the control in the world. Traction is very good as well – the driver never feels out of control, light or heavy rain. 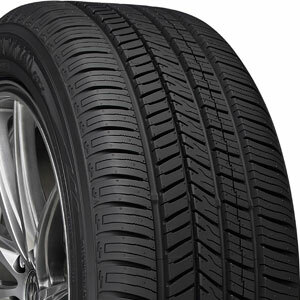 Braking performance is above average as well – not the best of all touring tires, but very close. Another very good showing for the YK740 GTX. That Orange Oil really helps in winter driving, keeping the rubber more pliable and softer when the temperatures drop below zero. The deep grooves and biting edges help with better snow traction – this is one of the better snow tires in the touring all-season category. That said, you should still not expect miracles and if there are harsh winter in your area, I strongly recommend a proper winter tire. One thing where I noticed worse performance than the best touring tires is ice traction and braking, which is a reason more not to use this tire in winter conditions. If you want a supremely quiet tire, look no further than the YK740 GTX. It’s quiet both in urban areas and on the highway at higher speeds, making traveling much more comfortable. Well, more comfortable for the ears – I would’ve liked a bit smoother ride. It’s not that the YK740 GTX is harsh on bumpy roads, but you can still feel more of the imperfections than in some other premium touring tires. I think it has become very clear by now – I like this tire very much. It’s one of the best touring tires handling wise, it provides safe wet traction and braking performance, and it’s even adequate in light snow. Given the fact that it’s a bit cheaper than other premium competitors, I can go over the fact that the ride is not as smooth and ice braking is below-par. Still, for the majority of car owners, this is one of the best touring tires out there. Thanks for reading and I hope you found this Yokohama YK740 GTX review helpful. If you have any questions or comments please feel free to leave them in the comments section below.